Tap this page for SPSC Jobs Advertisement 2019 | Sindh Public Service Commission. www.spsc.gov.pk Jobs 2019 are related to such jobs which are announced by the recruitment organization named SPSC, full name Sindh Public Service Commission. SPSC is the only organization in Sindh established by the Government of the Sindh with the purpose to recruit individuals at BPS-10 to BPS-18 or above in different Government Departments working in the province and like FPSC/PPSC/KPPSC it is also working superbly because it recruits all jobs on Merit Basis and not single case of bribery is noticed till now. 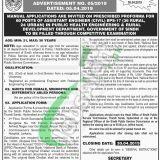 Currently, SPSC has announced latest SPSC Jobs 2019 and these positions are going to recruit for Public Health Engineering and Rural Development Department (Assistant Engineer (Civil) (BPS-17) (60 Posts)). These positions are announced on Rural and Urban Quotas which can be examined from the following image. Applicants willing to apply, should hold BE Civil at least in 2nd Division from a recognized University registration at Pakistan Engineering Council with relevant experience as per the demand of vacant positions is required to apply and detailed criteria are given in the advertisement separately for every position. Now in the following, we’ll discuss how to apply the procedure for SPSC Jobs 2019. For Complete list of vacancies in SPSC Advertisement 03/2019 can be examined from the following job advertisement. Fill the prescribed form and applications complete in all aspects should reach the SPSC Head Office and Regional Offices. Candidates are required to pay the examination fee in favor of SPSC. The SPSC Jobs last date for submission of application April 30, 2019. Test Date/Time/Venue will be communicated to the eligible candidate by the SPSC before one week of the test. For more jobs in Private/Government sector in Pakistan, please keep visiting our site JobsAlert.pk. Address: Sindh Public Service Commission Thandi Sarak, Hyderabad.